Harley J. Earl was born on this day in 1893 and went on to become one of the most influential men in automotive history, pioneering not only the promotion of design as an important facet of the automobile, but introducing the idea of the concept car itself. Without Harley Earl, there would be no Coffee and a Concept. Earl is credited with introducing the very idea of a conceptual design as not just a tool for the design process, but also as a marketing device for the automaker. He is believed to have been the first automotive designer to utilize free form sketching and hand sculpted clay models as tools for the design of vehicles – tools still used today. Harley J. Earl was born in Hollywood, California on November 22, 1893 to a family already deeply embedded in the field of transportation. His father, J.W. Earl, began working as a coachbuilder in 1889 and eventually went from horse-drawn carriages to the new-fangled automobile. 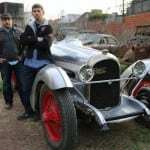 He crafted customized bodies, parts, and accessories for the autos of the day and founded Earl Automobile Works in 1908. Harley worked with his father as a boy, then entered Stanford University as a freshman, eventually dropping out to return to Earl Automotive Works (its name interchanged the “bile” with “tive”), which was thriving as a premier customization shop for the emerging Hollywood elite of the time. The Earls had their hands in building custom vehicles for movie stars like Fatty Arbuckle and Tom Mix. Cadillac dealer Don Lee purchased Earl Automotive Works when Earl, Senior departed, under the condition that he keep Harley Earl on board as director of the shop. When Lawrence P. Fisher, Cadillac’s general manager at the time, was touring Caddy dealers nationally, he met Earl and saw his work when visiting the Hollywood dealer. Even at this early stage, Harley was using modeling clay to develop forms for the vehicles he was customizing. Fisher commissioned Earl to design the 1927 LaSalle, which revolutionized automotive design at the time and earned Harley Earl the spot as the first director of General Motors’ new Art and Color Section, the company’s new design studio. Until the Art and Color Section’s creation, most automotive companies like GM designed vehicles based on the engineer’s needs and functionality, resulting in boxy, square-framed, generally style-free vehicles. Luxury cars were often sold as bare chassis assemblies that were sent to coachbuilders like Earl for personalization for the customer. As new head of the Art and Color Section in 1927, Earl struggled against conventions and unofficial titles like “pretty picture boy” and the Design Studio being referred to as the “Beauty Parlor.” Earl soldiered on, thanks to the tutelage of GM’s president Alfred P. Sloan, who saw the future of automotive being driven as much by style as by engineering innovation. Until the introduction of the first major design success, the Buick Y-Job, though, most in the industry did not put much credence into a design studio as a major facet of the automotive production process. Earl’s vision and success with the Y-Job, however, changed everything. 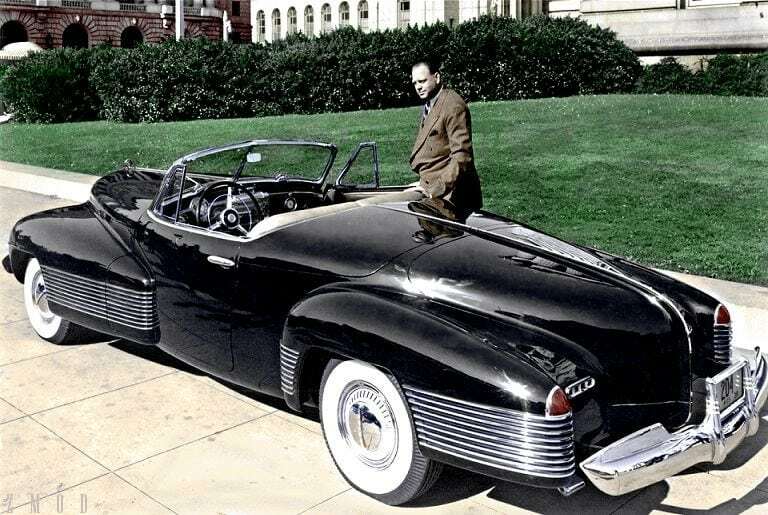 The Buick Y-Job, the first concept car in the motor industry, was innovative on every front. 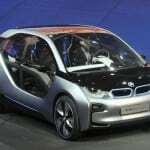 Built not as a one-off custom for sale or as a design exercise for testing, but instead as a custom meant to be showcased to the public to gauge reactions, it became the first acknowledged concept car as we know them today. It was also Earl’s daily driver for much of his career at GM. 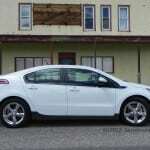 Read about the Buick Y-Job here. Through several innovations, possibly the most-recognizable concept car of all time was Earl’s 1951 LaSabre. Known as the Experimental Laboratory On Wheels, the LaSabre put many automotive conventions on their ear when it was introduced. It heavily influenced vehicles from that point forward and elements from it can still be seen in today’s designs. Read more about the 1951 LeSabre here. Two years after the LsaSabre concept, Earl introduced one of the most iconic series of concepts ever created: the General Motors Firebird series. These concepts didn’t just throw aircraft ideas at automobiles, but stretched the idea of what a car really was in many ways by exploring the aerodynamics of aircraft with the versatile needs of the car itself. Read more about the Firebird series here. That same year, Earl and GM introduced what would become his most enduring automotive legacy: the EX-122 and the beginnings of the Corvette empire. While Earl himself was not initially too enthusiastic about the idea behind the ‘vette, he eventually came around after seeing what he could do with the design concept. Read more about the EX-122 and the Corvettes here. In 1957, as a tribute to his first official General Motors commission, Earl was asked to create a second LaSalle design. Greatly influenced by the work with the Corvettes that, at that time, was still ongoing, the 1957 LaSalle II would eventually become the basis for the most iconic Corvette of all time, the 1956-57 models. Read more about the 1957 Cadillac LaSalle II concepts here. Finally, before retiring at the end of 1958, Harley Earl wanted to complete his dream car vision as a new concept. Called the XP-74 during the design process, the car eventually debuted as the 1959 Cadillac Cyclone and was the final design Harley Earl created for General Motors before his retirement. You can read more about the 1959 Cadillac Cyclone here. Readers may have noticed a large gap between the Y-Job and the LaSabre in the above timeline of influential designs in Earl’s career. Much of that time was spent working on projects for the U.S. government at General Motors during World War II. With cutbacks and government contracts ruling the day, concept cars became a side note and most automakers sidelined or halted introduction of new models during the war. Many converted plants to build machines for the war effort. During this time, Earl’s most well-known work was in camouflage design for the U.S. military. In 1942, Earl established a research and training division at GM specifically for this purpose. The team produced a document titled Camouflage Manual for General Motors Camouflage based largely on the work of former GM designers Harold Ledyard Towle and McClelland Barclay, both of whom had worked on camouflage ideas during World War I. Earl’s program during the war taught people like David Jones, who was at GM’s Vauxhall Motors in Britain and who served in the camouflage section at the Royal Engineers in WWII. 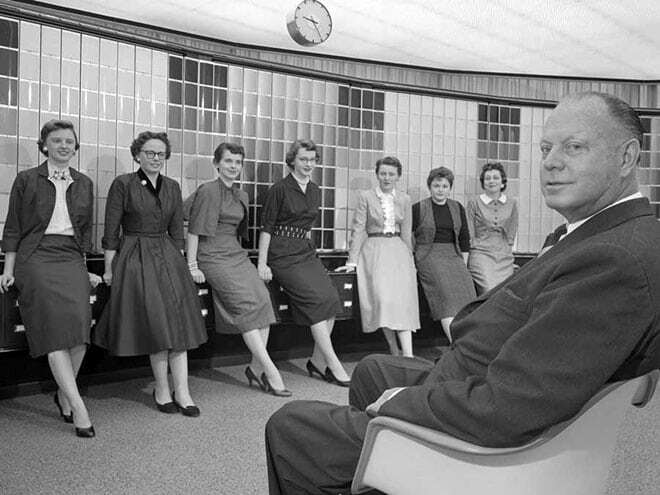 Harley J. Earl left General Motors at the end of 1958 and the last year his hands-on design work was influential at the company was in the 1959 model lineup. He moved to West Palm Beach, Florida and on April 10, 1969, he suffered a stroke and died. He was 75 years old. 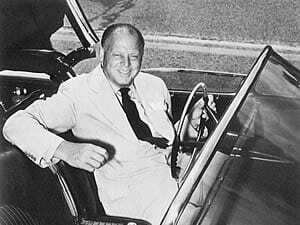 Harley Earl is remembered for many, many firsts in the automotive industry. He’s credited with allowing and influencing the introduction of the tailfin into automotive design, for creating the idea of a concept car, for introducing two-tone paint, wraparound windshields, and for introducing the most stylistic of American automotive design points: the long, low sedan. The Firebird I is in miniature as the topper for the Harley J. Earl Trophy given to the season-opening race winner of the Daytona 500 NASCAR race. Earl or his likeness have appeared on film, television, and other media including a tribute to him created by Buick for an advertising campaign in 2001-02. Earl’s most endearing legacy, however, is the Corvette, one of the longest-running and most-loved of American sports cars. 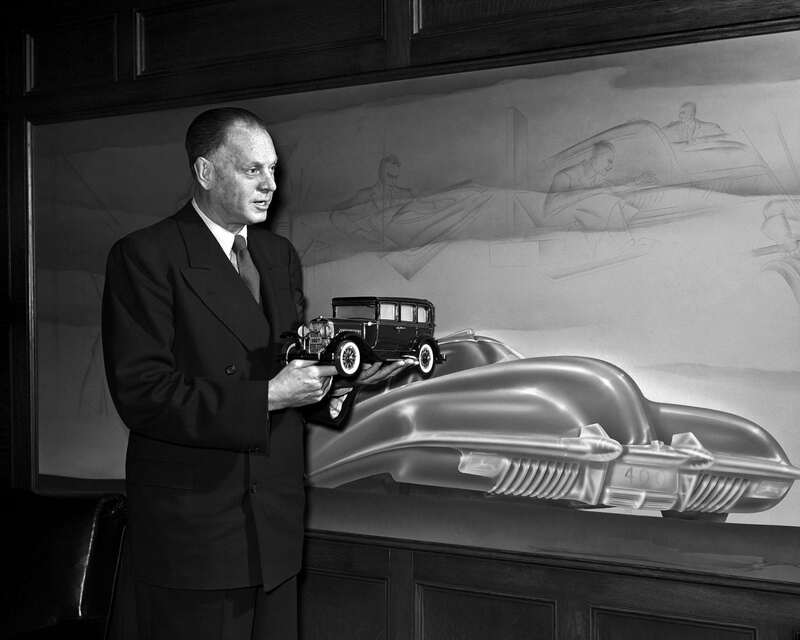 During his long career, including twenty-eight years at General Motors, Harley J. Earl did more to influence automotive design than any other single person in history. His true legacy will be seen in every vehicle we drive and in every concept showcased here at Coffee and a Concept, no matter the automaker presenting it.